115. Vlaminck S, Speleman K, Prokopakis E, Kawauchi H, van Cutsem J, Hellings P, Jorissen M, Acke F, Bachert C, van Zele T, Gevaert P. ESS in CRSwNP patients:outcome 10 years after. Annual Meeting of the American Rhinologic Society. Chicago IL, USA, September 8-9, 2017. 114. Fothiadaki IR, Prokopakis E, Karatzanis A, Doulaptsi M, Fountakis E, Klonaris D, Velegrakis G. Efficacy of the bone marrow mesenchymal stem cells injection into the olfactory bulb. 4th Congress of the European ORL-HNS. Barcelona, Spain, October 7-11, 2017. 113. Fothiadaki IR, Karatzanis A, Prokopakis E, Doulaptsi M, Klonaris D, Fountakis E, Velegrakis G. Measurement of parathormone levels as a predictive marker of post-operative hypocalcemia following total thyroidectomy. 4th Congress of the European ORL-HNS. Barcelona, Spain, October 7-11, 2017. 112. Milioni A, Karatzanis A, Prokopakis E, Klonaris D, Fountakis E, Velegrakis G. Parathyroid hormone as a predictor of postoperative hypocalcemia after total thyroidectomy. 21st World Congress of the International Federation of Otorhinolaryngological Societies. Paris, France, June 24-28, 2017. 111. Milioni A, Prokopakis E, Karatzanis A, Fountakis E, Klonaris D, Velegrakis G. Late diagnosis of tracheobronchial foreign body in pediatric population. 21st World Congress of the International Federation of Otorhinolaryngological Societies. Paris, France, June 24-28, 2017. 110. Doulaptsi M, Steelant B, Prokopakis E, Hellings P. Fluticasone propionate and mometasone furoate are equally effective in restoring epithelial barrier defects in allergic rhinitis. XXXVI Meeting of the European Academy of Allergy and Clinical Immunology. Helsinki, Finland, June 17-21, 2017. 109. Kaprana A, Hemmerlein B, Lyronis G, Prokopakis E, Fountakis E, Leuwer R. Pecoma of the nasal cavity: A case report. 26th Congress of the European Rhinologic Society. Stockholm, Sweden, July 3-7, 2016. 108. Milioni A, Prokopakis E, Karatzanis A, Daraki V, Floroskoufi P, Fountakis E, Velegrakis G. Brown tumor of the maxilla due to atypical parathyroid adenomas. 26th Congress of the European Rhinologic Society. Stockholm, Sweden, July 3-7, 2016. 107. Prokopakis E, Milioni A, Lymperidis I, Kaprana A, Velegrakis S, Velegrakis G. SNOT-22 reveals latent pathology in young adults. 26th Congress of the European Rhinologic Society. Stockholm, Sweden, July 3-7, 2016. 106. Milioni A, Karatzanis A, Prokopakis E, Fountakis E, Kaprana A, Velegrakis G. Neglected diabetes mellitus and rhinocerebral mucormycosis. 26th Congress of the European Rhinologic Society. Stockholm, Sweden, July 3-7, 2016. 105. Vlaminck S, Speleman K, Kawauchi H, Prokopakis E, van Cutsem J, Acke F, van Cauwenberge P, Jorissen M, Hellings P, Bachert C, Gevaert P. Analysis of sinonasal airway mucus secretions helps in predicting outcome after ESS. 26th Congress of the European Rhinologic Society. Stockholm, Sweden, July 3-7, 2016. 104. Vlaminck S, Speleman K, Prokopakis E, Kawauchi H, Hellings P, Jorissen M, Acke F, Bachert C, Gevaert P. The presence of eosinophilic mucin and fungal hypnae influences the surgical outcome in nasal polyp patients. 26th Congress of the European Rhinologic Society. Stockholm, Sweden, July 3-7, 2016. 103. Taki K, Chatzakis N, Doulaptsi M, Velegrakis S, Prokopakis E. Bronchoscopy in pediatric patients with tracheobronchial foreign body late diagnosis. 13th Congress of the European Society of Pediatric Otorhinolaryngology. Lisbon, Portugal, June 18-21, 2016. 102. Fountakis E, Chatzakis N, Kaprana A, Taki A, Prokopakis E. A rare case of congenital cholosteatoma of a six year old girl. 13th Congress of the European Society of Pediatric Otorhinolaryngology. Lisbon, Portugal, June 18-21, 2016. 101. Chatzakis N, Taki K, Velegrakis S, Milioni A, Prokopakis E. Efficacy of ASSR and ABR testing without sedation in peadiatric patients. 13th Congress of the European Society of Pediatric Otorhinolaryngology. Lisbon, Portugal, June 18-21, 2016. 100. Milioni A, Spernovasilis N, Gialamas I, Stylianou K, Velegrakis S, Prokopakis E. Association of streptococcal pharyngitis and microscopic polyangiitis: A case report. ENT Update Meeting, Vienna, Austria, June 9-10, 2016. 99. Prokopakis E, Milioni A, Kaprana A, Chalkiadakis G, Melissas J, Karatzanis A, Klonaris D, Velegrakis G. Association between the increase of papillary thyroid carcinoma incidence on Crete Island and radioactive agents. ENT Update Meeting, Vienna, Austria, June 9-10, 2016. 98. Chatzakis N, Kotzamani D, Karatzanis A, Velegrakis S, Prokopakis E. Benign paroxysmal positional vertigo: 20 years experience in treating 1195 patients with canalith repositioning procedure. 2nd Congress of the European Academy of Neurology. Copenhagen, Denmark, May 28-31, 2016. 97. Chatzakis N, Prokopakis E, Taki K, Doulaptsi M, Panagiotaki E, Velegrakis G. 20 years experience in treating BPPV, in a tertiary referral center. 3rd Congress of European ORL-HNS. Prague, Czech Republic, June 7-11, 2015. 96. Prokopakis E, Doulaptsi M, Kaprana A, Chatzakis N, Velegrakis G. Effectiveness of thyroid surgery in a tertiary Otorhinolaryngologic department; The University of Crete experience. 3rd Congress of European ORL-HNS. Prague, Czech Republic, June 7-11, 2015. 95. Chatzakis N, Prokopakis E, Foudakis E, Velegrakis G. Efficiency of ASSR as a hearing screening test in term neonates, infants and young children: a comparison with click-ABR. 12th Congress of European Federation of Audiologic Societies. Istanbul, Turkey, May 27-30, 2015. 94. Chatzakis N, Prokopakis E, Foudakis E, Velegrakis G. ASSR and ABR without sedation in pediatric individuals. 12th Congress of European Federation of Audiologic Societies. Istanbul, Turkey, May 27-30, 2015. 93. Eliopoulos E, Goulielmos G, Thireou T, Zervou MI, Velegrakis G, Prokopakis E. Mutational analysis and molecular interactions of the ACVRL1 protein and implications for Rendou-Osler-Weber disease. 9th Conference of the Hellenic Society for Computational Biology & Bioinformatics. Athens, Greece, October 10-12, 2014. 92. Kaprana A, Prokopakis E, Koudounarakis L, Velegrakis G. Efficacy of inferior turbinoplasty with the use of CO2 laser, radiofrequency, and electrocautery. 25th Congress of the European Rhinologic Society. Amsterdam, The Netherlands, June 22-26, 2014. 91. Vlaminck S, Vauterin T, Kawauchi H, Prokopakis E, Hellings P, Jorissen M, Acke F, Van Cauwenberge P, Bachert C, Gevaert P. The presence of eosinophilic mucin influences the surgical outcome in nasal polyp patients. 25th Congress of the European Rhinologic Society. Amsterdam, The Netherlands, June 22-26, 2014. 90. Kawauchi H, Ou M, Aoi N, Morikura I, Fuchiwaki T, Takaiwa F, Tagaki H, Prokopakis E. Mucosal immunity of nasopharynx and ist clinical impact on allergic rhinitis. 25th Congress of the European Rhinologic Society. Amsterdam, The Netherlands, June 22-26, 2014. 89. Kawauchi H, Kim K, Prokopakis E. Innate and acquired immunity and its clinical impact on the pathogenesis of upper respiratory tract inflammation. VII International Symposium on recent advances in rhinosinusitis and nasal polyposis. Matsue, Japan, October 4-6, 2013. 88. Kaprana A, Chalkiadakis G, Sifaki D, Velegrakis G, Melissas J, Prokopakis E. Papillary thyroid carcinoma incidence in the island of Crete associated with increased radioactive agents due to Chernobyl accident. 20th World Congress of the International Federation of Otorhinolaryngological Societies. Seoul, Korea, June 1-5, 2013. 87. Prokopakis E, Kaprana A, Christodoulou P, Chatzakis N, Velegrakis G. Our 16 year experience treating 965 patients with BPPV. 20th World Congress of the International Federation of Otorhinolaryngological Societies. Seoul, Korea, June 1-5, 2013. 86. Prokopakis E, Koudounarakis E, Panagiotaki I, Karatzanis A, Velegrakis S, Velegrakis G. Comparison of carbon dioxide laser, radiofrequency and electrocautery for inferior nasal turbinate reduction. 2nd Congress of European ORL-HNS. Nice, France, April 27-30, 2013. 85. Chatzakis N, Chatzidakis A, Koudounarakis E, Prokopakis E, Christodoulou P, Velegrakis G. The role of ASSR and ABR in the detection of sensorineural hearing loss in pediatric population: Experience of a tertiary center. 2nd Congress of European ORL-HNS. Nice, France, April 27-30, 2013. 84. Koudounarakis E, Karatzanis A, Prokopakis E, Drositis I, Papadakis I, Velegrakis G. Tracheal diverticulum presenting with globus pharyngeus. 2nd Congress of European ORL-HNS. Nice, France, April 27-30, 2013. 83. Prokopakis E, Koudounarakis E, Chatzakis N, Vlastos I, Christodoulou P, Velegrakis G. A 16-year experience treating 965 patients with BPPV in a single institution. 2nd Congress of European ORL-HNS. Nice, France, April 27-30, 2013. 82. Koudounarakis E, Prokopakis E, Kaprana A, Chatzakis N, Panagiotaki I, Velegrakis G. Adult rhabdomyoma of the puriform sinus: a case report. 2nd Congress of European ORL-HNS. Nice, France, April 27-30, 2013. 81. Koudounarakis E, Chatzakis N, Panagiotaki I, Papadakis I, Prokopakis E, Velegrakis G. Synchronous multifocal medullary and papillary thyroid carcinoma: report of a case. 2nd Congress of European ORL-HNS. Nice, France, April 27-30, 2013. 80. Kaprana A, Nikolaou V, Velegrakis S, Vlastos I, Prokopakis E. Septal deviation as causive factor for chronic rhinosinusitis. Review of the literature. 24th Congress of the European Rhinologic Society.Toulouse, France, 17-21 June, 2012. 79. Vlastos I, Prokopakis E, Kaprana A, Velegrakis G. The role of medial maxilloctomy/denker procedure in the treatment of chronic rhinosinusitis. 24th Congress of the European Rhinologic Society.Toulouse France, 17-21 June, 2012. 78. 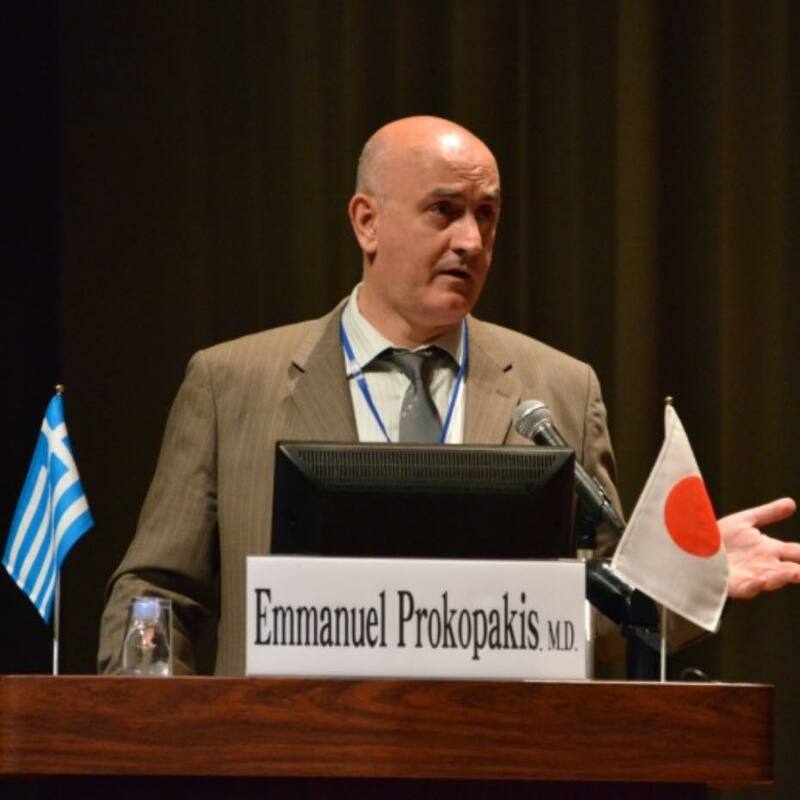 Nikolaou V, Prokopakis E, Kaprana A, Koudounarakis E, Velegrakis G. Small cell neuroendocrine carcinoma of the sinonasal track. 24th Congress of the European Rhinologic Society.Toulouse France, 17-21 June, 2012. 77. Prokopakis E, Kaprana A, Koudounarakis E, Papadakis I, Schiniotaki I, Velegrakis G. Internal carotid artery presenting as a pulsative oropharyngeal mass. 1st Congress of CE-ORL-HNS. Barcelona, Spain, July 2-6, 2011. 76. Koudounarakis E, Prokopakis E, Papadakis I, Panagiotaki I, Schiniotaki I, Karatzanis A, Bizakis I, Velegrakis G. A 16-year experience with intranasal laser assisted dacryocystorhinostomy. 1st Congress of CE-ORL-HNS. Barcelona, Spain, July 2-6, 2011. 75. Koudounarakis E, Prokopakis E, Panagiotaki I, Karatzanis A, Chatzakis N, Vlastos I, Papadakis I, Velegrakis G. Melanomas of the Nose and Paranasal Sinuses. Advances and Perspectives in Thoracic and Upper Aerodigestive Malignancies. Athens, Greece, March 10-13, 2011. 74. Papadakis I, Prokopakis E, Karatzanis A, Panagiotaki I, Chatzakis N, Koudounarakis E, Velegrakis G. Solitary fibrus tumor oft he nasal cavity and paranasal. Forum of Clinical Oncology. Advances and Perspectives in Thoracic and Upper Aerodigestive Malignancies. Athens, Greece, March 10-13, 2011. 73. Papadakis IA, Vardouniotis AS,Panagiotaki IE, Velegrakis SG, Lagoudianakis GM, ProkopakisEP. Cutaneous Leismaniasis in Immunocompromised Patient. 23rd Congress of the European Rhinologic Society. Geneva, Switzerland, combined with the 29th International Symposium of Infection & Allergy of the Nose. Geneva, Switzerland, June 20-24, 2010. 72. Prokopakis EP, Helidonis ES, Velegrakis GA. Increased incidence of thyroid cancer in Crete. Is this the effect of Chernobyl fallout? VI Balkan Congress of Otorhinolaryngology Head and Neck Surgery. Thessaloniki, Greece, October 2-5, 2008. 71. Prokopakis EP, Bourolias CA, Velegrakis GA, Sobol E, Helidonis ES. The use of erbium dopped glass laser in septoplasty. American Academy of Otolaryngology – Head and Neck Surgery Annual Meeting. Chicago, Illinois, USA, September 21-24, 2008. 70. Karatzanis A, Fragiadakis G, Moschandrea J, Prokopakis E, Panagiotaki E, Bizakis J, Psychogios G, Velegrakis G. Allergic rhinitis considerably affects septoplasty results. 22nd Congress of the European Rhinologic Society, combined with the 27th International Symposium of Infection & Allergy of the Nose. Hersonissos, Crete, Greece, June 15-19, 2008. 69. Karatzanis A, Kaprana A, Bouroliaw C, Shiniotaki E, Prokopakis E, Velegrakis G. Anaphylaktische Reaktion am Strand. Ist es eine interessante Erkennunug? Zur 79. Jahresversammlung der Deutshen Gesellschaft fur Hals-Nasen-Ohren-Heikunde, Kopf- und Hals-Chirurgie e. V. Bonn, Germany, April 30-May 4, 2008. 68. Bourolias C, Prokopakis E, Velegrakis G, Sobol E, Svistushkin V, Helidonis E. Septal cartilage reshaping with the use of an Erbium doped glass fiber laser. 12th Congress of the International Rhinologic Society, Venice, Italy, December 5-9, 2007. 67. Karatzanis A, Samara K, Tzotzaki E, Prokopakis E, Zervou M, Helidonis E, Siafakas N, Velegrakis G. Assessment of microsatellite DNA instability in various nasal cytology samples. 6th European Congress of Otorhinolaryngology Head and Neck Surgery, Vienna, Austria, June 30th – July 4th, 2007. 66. Prokopakis E, Lachanas V, Hadzakis N, Karatzanis A, Helidonis E, Velegrakis G. The use of Ligasure in Otolaryngology – Head and Neck Surgery. 6th European Congress of Otorhinolaryngology Head and Neck Surgery, Vienna, Austria, June 30th – July 4th, 2007. 65. Fragiadakis GM, Lachanas V, Prokopakis EP, Karadzanis AD, Mpourolias C, Bizakis JG, Helidonis ES, Velegrakis GA. Novel tonsillectomy procedures. IXth International Congress of the European Society of Pediatric Otorhinolaryngology. Paris, France, June 18-21, 2006. 64. Malandrakis SG, Prokopakis EP, Christodoulou PN, Velegrakis GA. Indications for laser assisted tympanostomy in pediatric patients with serous otitis media. IXth International Congress of the European Society of Pediatric Otorhinolaryngology. Paris, France, June 18-21, 2006. 63. Prokopakis E, Malandrakis S, Christodoulou P, Panagiotaki E, Karatzanis A, Bizakis J, Velegrakis G. Long term results of intranasal Laser Assisted Dacryocystorhinostomy with the use of a surgical microscope. 21st Congress of the European Rhinologic Society. Tampere, Finland, June 11-15, 2006. 62. Kaprana A, Karatzanis A, Prokopakis E, Panagiotaki E, Malandrakis S, Bizakis J, Velegrakis G. Endonasale Dakryozystorhinostomie mit dem Operationsmikroskop und CO2 Laser. Zur 77. Jahresversammlung der Deutschen Gesellschaft fur Hals-Nasen-Ohren-Heilkunde, Kopf- und Hals-Chirurgie e. V. Mannheim, Germany May 24-28, 2006. 61. Prokopakis E, Velegrakis G, Chimona T, Bizakis J, Christodoulou P, Helidonis E. Benign Paroxysmal Positional Vertigo: 10 years experience in treating 592 patients with canalith repositioning procedure. The XVIIIth World Congress of The International Federation of Oto-Rhino-Laryngological Societies (IFOS). Rome, Italy 25-30 June, 2005. 60. Gelis N, Helidonis E, Velegrakis G, Gelis D, Pagalos A, Prokopakis E. The phychological profil of the allergic rhinitis patients in Greece. The XVIIIth World Congress of The International Federation of Oto-Rhino-Laryngological Societies (IFOS). Rome, Italy 25-30 June, 2005. 59. Lachanas V, Prokopakis E, Malandrakis S, Bourolias C, Christodoulou P, Velegrakis G. Topical use of Mitomycin-C in radiofrequency myringotomy: an experimental study in rabbit. The XVIIIth World Congress of The International Federation of Oto-Rhino-Laryngological Societies (IFOS). Rome, Italy 25-30 June, 2005. 58. Prokopakis E, Lachanas V, Malandrakis S, Benakis A, Velegrakis G. The use of Ligasure Vessel Sealing System in Otolaryngology-Head and Neck Surgery. The XVIIIth World Congress of The International Federation of Oto-Rhino-Laryngological Societies (IFOS). Rome, Italy 25-30 June, 2005. 57. Prokopakis E, Christodoulou P, Helidonis E, Velegrakis G. Benign paroxysmal positional vertigo: 9-year experience in treating 522 patients with canalith repositioning procedure. 5th European Congress of Otorhinolaryngology Head and Neck Surgery, Rhodes-Kos, Greece, September 11-16, 2004. 56. Lachanas V, Prokopakis E, Malandrakis S, Hadjiioannou J, Bizakis J, Velegrakis G. Incidence of thyroid carcinoma in our practice; A 14 years experience. 5th European Congress of Otorhinolaryngology Head and Neck Surgery, Rhodes-Kos, Greece, September 11-16, 2004. 55. Lachanas V, Prokopakis E, Benakis A, Karadzanis A, Malandrakis S, Velegrakis G. Implications of Laser assisted tympanostomy in adults. 5th European Congress of Otorhinolaryngology Head and Neck Surgery, Rhodes-Kos, Greece, September 11-16, 2004. 54. Lachanas V, Prokopakis E, Benakis A, Malandrakis S, Karatzanis A, Velegrakis G. A huge frontal sinus mucocele presenting with symptomatic epilepsy: a case report. 20th Congress of the European Rhinologic Society. Istanbul, Turkey, June 18-25, 2004. 53. Lachanas V, Malandrakis S, Prokopakis E, Benakis A, Bizakis J, Velegrakis G. Successful treatment of rhinocerebral mucormycosis with liposomal amphotericin B and surgery in three diabetic patients. 20th Congress of the European Rhinologic Society. Istanbul, Turkey, June 18-25, 2004. 52. Prokopakis E, Helidonis E, Velegrakis G. Treating Benign Paroxysmal Positional Vertigo in Crete. European Academy of Otology and Neuro-Otology Intensive Summer Course. Sunny Beach, Bulgaria, June 6-8, 2004. 51. Velegrakis G, Lachanas V, Prokopakis E, Helidonis E. Cochlear implantation program in Crete. European Academy of Otology and Neuro-Otology Intensive Summer Course. Sunny Beach, Bulgaria, June 6-8, 2004. 50. Prokopakis E, Constantinidis J, Karatzanis A, Velegrakis G. Die Verwendung des Ligasure Vessel Scaling System in der Schilddrusenchirurgie. 75 Jahresversammlung der Deutschen Gesellschaft fur Halls-Nasen-Ohren-Heilkunde, Kopf- und Halschirurgie. Bad Reichenhall, May 19-23, 2004. 49. 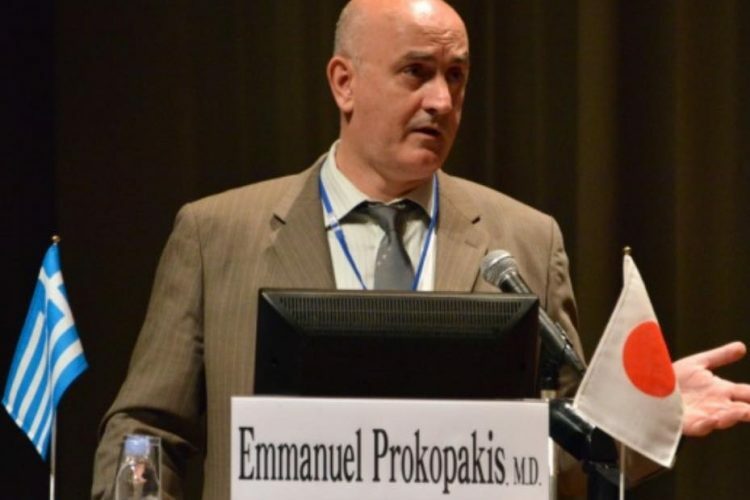 Papadakis CE, Drivas E, Chimona TS, Hatziioannou J, Kyrmizakis D, Prokopakis EP, Bizakis JG, Velegrakis GA. Bronchoscopy for tracheobronchial foreign bodies aspiration in children. An 11 year experience. 6th International Conferrence on Pediatric Otorhinolaryngology. Athens, Greece, May 16-19, 2004. 48. Tsagournisakis M, Prokopakis E, Chimona T, Erimaki S, Velegrakis G. Canalith repositioning procedure is an effective treatment for benign paroxysmal positional vertigo: Long-term results in 460 patients. 56th Annual Meeting of the American Academy of Neurology. San Fransisco, USA, April 24-May 1, 2004. 47. Prokopakis E, Laxanas V, Velegrakis G. Indications for laser assisted tympanotomy in adults. ILLA / LTL ‘2003 International Conference and Symposium in Laser Technology and Lasers. Plovdiv, Bulgaria, September 27 – October 1, 2003. 46. Malandrakis S, Prokopakis E, Sidoris M, Karadzanis A, Velegrakis G, Helidonis E. Endoscopic laser arytenoidectomy with the use of CO2 laser. ILLA / LTL ‘2003 International Conference and Symposium in Laser Technology and Lasers. Plovdiv, Bulgaria, September 27 – October 1, 2003. 45. Prokopakis EP, Hajiioannou JK, Velegrakis GA, Balas C, Helidonis ES. The assessment of histamine induced skin reaction by the objective measurement of erythema formation, with the use of a multispectral imaging system. American Academy of Otolaryngologic Allergy annual meeting, Florida, USA, September 18-20, 2003. 44. Chatzi L, Prokopakis E, Tzanakis N, Alegakis A, Bizakis I, Lionis C. Allergic rhinitis, asthma and atopy among grapevine farmers in a rural population in Crete, Greece. 9th Conference of the European Society of General practice/Family Medicine Ljubliana, Slovenia, June 18-21, 2003. 43. Prokopakis E, Chimona T, Tsagournisakis M, Christodoulou P, Helidonis E, Velegrakis G. The Epley maneuver. Our 8-year experience in 460 patients with benign paroxysmal positional vertigo. 6th EFAS. European Federation of Audiology Societies. Creta Maris Conference Centre, Crete, Greece, 28-31 May 2003. 42. Prokopakis E, Delides A, Sintoris M, Chimona T, Helidonis E. The Epley maneuver. Our 8-year experience in 460 patients with benign paroxysmal positional vertigo. Vertigo meeting. International Meeting in Otology and Neuro Otology, Stara Zagora-Zheravna, Bulgaria, May 15-18, 2003. 41. Chimona T, Prokopakis EP, Bizakis J, Hatziioannou J, Karatzanis A, Helidonis E. Chronic cholesteatomatous otitis in children and adults. A retrospective study. Vertigo meeting. International Meeting in Otology and Neuro Otology, Stara Zagora-Zheravna, Bulgaria, May 15-18, 2003. 40. Prokopakis EP, Hajiioannou JK, Velegrakis GA, Karatzanis AD, Samara A, Helidonis ES. Laser assisted tympanostomy (LAT) in chronic serous otitis media. Our experience in allergic children. 2nd course on : Advances in OtoRhinoLaryngology Head & Neck Surgery 2002, Mykonos, Hellas, May 24-26, 2002. 39. Prokopakis EP, Hajiioannou JK, Velegrakis GA, Balas C, Themelis G, Helidonis ES. The assessment of histamine induced skin reaction by the objective measurement of erythema formation, with the use of a multispectral imaging system. The XVIIth World Congress of The International Federation of Oto-Rhino-Laryngological Societies (IFOS). Cairo, Egypt, 28th Sept-3 Oct., 2002. 38. Prokopakis EP, Hajiioannou JK, Velegrakis GA, Christodoulou PN, Helidonis ES. The role of laser assisted tympanostomy in treating allergic children with chronic serous otitis media. The XVIIth World Congress of The International Federation of Oto-Rhino-Laryngological Societies (IFOS). Cairo, Egypt, 28th Sept-3 Oct., 2002. 37. Prokopakis E, Hajiioannou JK, Velegrakis GA, Karatzanis AD, Panagiotaki I, Proimos E, Helidonis ES. The role of Laser Assisted Tympanostomy (LAT) in treating allergic children with chronic serous otitis media. 8th International Congress of Paediatric Otorhinolaryngology, Oxford Examination Schools Oxford UK, 11-14 September 2002. 36. Prokopakis EP, Karatzanis A, Velegrakis GA, Papadakis CH, Helidonis ES. Laser Assisted Tympanostomy (LAT) in treating allergic children with chronic serous otitis media. International Interdisciplinary Meeting in Otology & Neuro-Otology, Stara Zagora-Etara, Bulgaria, May 2002. 35. Velegrakis GA, Karatzanis A, Papadakis CH, Prokopakis EP, Parasyris P, Helidonis ES. A newly designed stapedotomy prosthesis. International Interdisciplinary Meeting in Otology & Neuro-Otology, Stara Zagora-Etara, Bulgaria, May 2002. 34. Pagalos A, Prokopakis EP, Velegrakis GA, Gioulekas D, Bizakis JG, Helidonis ES. Airbone pollen survey of central Crete, Greece. Joint meeting of Panhellenic Society of Otolaryngology-Head and Neck Surgery and the AAO-HNS, Vouliagmeni Athens, June 20-3, 2001. 33. Hajiioannou J, Prokopakis E, Velegrakis G, Balas C, Themelis G, Helidonis E.The assessment of histamine induced skin reaction by objective measurement of the erythema formation, with the use of a Multispectral Imaging System. 2nd world Congress of Otorhinolaryngologic Allergy Endoscopy and Laser Surgery. 11th Pan-Hellenic Congress of Oto-Rhino-Laryngology Head and Neck Surgery, Athens, Greece, June 2001. 32. Prokopakis EP, Karatzanis A, Tsagournisakis M, Christodoulou PN, Helidonis ES. Benign Paroxysmal Positional Vertigo. Experience with 323 patients over the last seven years. 2nd World Congress of Otolaryngologic Allergy Endoscopy and Laser Surgery Pan-Hellenic Congress of Oto-Rhino-Laryngology Head and Neck Surgery, Athens, Greece, June 2001. 30. Prokopakis EP, Velegrakis GA, Balas CJ, Helidonis ES. Premalignant lesion and epithelial cancer detection and grading in head and neck region,using hyper-spectral dynamic imaging. 4th European Congress of Otorhinolaryngology Head and Neck Surgery, Berlin, Germany, May 13-18, 2000. 29. Prokopakis EP, Bizakis JG, Papadakis D, Velegrakis GA, Balas CJ, Helidonis ES. In vivo detection and staging of epithelial dysplasias and malignancies of the head and neck region, based on the quantitative assessment of acetic acid-tissue interaction kinetics. Advances in Otolaryngology-Head and Neck Surgery 2000, Santorini, Greece, May 4-6, 2000. 28. Papadakis CH, Prokopakis EP, Themelis GC, Helidonis ES. Laser assisted myringotomy in patients with serous otitis media. AAO-HNS Annual Meeting, New Orleans, Lousiana, September 26-29, 1999. 27. Papadakis CH, Bizakis JG, Velegrakis GA, Prokopakis EP, Helidonis ES. Foreign bodies of the lower respiratory tract in Crete. 50th Anniversary Extraordinary Congress of Spanish Society of Otolaryngology-Head and Neck Surgery, Madrid, Spain, October 24-27, 1999. 26. Nikolidakis AA, Velegrakis GA, Prokopakis EP, Naoumidi I, Helidonis ES. Immunological and immunohistochemical factors involved in cartilage prevention and absorption, with the use of CO2 laser irradiation. 50th Anniversary Extraordinary Congress of Spanish Society of Otolaryngology-Head and Neck Surgery, Madrid, Spain, October 24-27, 1999. 25. Prokopakis EP, Balas CJ, Karatzanis A, Themelis G, Helidonis ES. Premalignant lesion and epithelial cancer detection and grading in head and neck region, using multispectral dynamic imaging. 50th Anniversary Extraordinary Congress of Spanish Society of Otolaryngology-Head and Neck Surgery, Madrid, Spain, October 24-27, 1999. 24. Prokopakis EP, Balas CJ, Themelis GC, Helidonis ES. In vivo cancer detection and grading using multispectral imaging. AAO-HNS Annual Meeting, New Orleans, Lousiana, September 26-29, 1999. 23. Themelis G, Prokopakis E, Pagalos A, Papadakis B, Balas C, Helidonis E. In vivo quantitative assessment of immunological and allergic status using multispectral imaging. VI International Conference in Medical Physics, Patras, Greece, 1-4 September 1999. 22. Balas C, Themelis G, Prokopakis E, Koumantakis E, Helidonis E. Epithelial cancers and precancers detection and grading using Multi-spectral Dynamic Imaging. VI International Conference in Medical Physics, Patras, Greece, 1-4 September 1999. 21. Helidonis ES, Prokopakis EP, Themelis GC, Velegrakis GA, Tosca AD, Balas CJ. In vivo study of acetic acid-scc interaction using multispectral imaging. The 2nd International Symposium in Israel on Head and Neck Surgery and Oncology, Jerusalem, Israel, November 1-5, 1998. 20. Skoulakis C, Nikolidakis A, Papadakis C, Velegrakis GA, Prokopakis EP, Bizakis GJ, Helidonis ES. Swiftlase turbinoplasty. 17th ERS and ISIAN Meeting, Vienna, July 28-August 1, 1998. 19. Balas CJ, Themelis G, Prokopakis EP, Velegrakis GA, Helidonis ES. Acetic acid squamous cell carcinoma interaction study using multispectral imaging. 45th Congress of the Slovac Society for Otolaryngology, Head and Neck Surgery. Bratislava, Slovac Republic, October 7-10, 1998. 18. Helidonis ES, Prokopakis EP, Skoulakis C, Themelis G, Balas CJ. In vivo study of flare kinetics in skin puncture test using multiband imaging. 45th Congress of the Slovac Society for Otolaryngology, Head and Neck Surgery. Bratislava, Slovac Republic, October 7-10, 1998. 17. Velegrakis GA, Prokopakis EP, Papadakis C, Helidonis ES. A new stapedotomy prosthesis. The “Velegrakis Piston”. AAO-HNS Annual Meeting. San Antonio, Texas, September 13-16, 1998. 16. Prokopakis EP, Christodoulou PN, Bizakis JG, Papadakis CE, Balas CJ, Helidonis ES. Quantitative endoscopic imaging of the back scattered light in assessing nasal mucosa blood flow. 1st World Congress of Otolaryngologic Allergy, Endoscopy and Laser Surgery. Athens, June 24-27, 1998. 15. Τhemelis G, Prokopakis EP, Velegrakis GA, Skoulakis CE, Helidonis ES. Dynamic, two dimensional study of erythema development characteristics in prick-puncture test. 1st World Congress of Otolaryngologic Allergy, Endoscopy and Laser Surgery. Athens, June 24-27, 1998. 14. Christodoulou PN, Vallianatou NG, Prokopakis EP, Helidonis ES. Management of Tinnitus Patients with Different Personality Characteristics. 18TH European Seminar on Tinittus and Hyperacusis. Nottigham, April 5-9, 1998. 13. Christodoulou PN, Prokopakis EP, Balas CJ, Helidonis ES. Endoscopic Machine Vision Estimation of the Nasal Mucosa Hematosis. 16th World Congress of Otorhinolaryngology-Head and Neck Surgery. Sydney, Australia, March 2-7, 1997. 12. Balas CJ, Prokopakis EP, Christodoulou PN, Helidonis ES. A Multi-Wavelength Imaging System for Ear Drum Infrared Diaphanoscopy. 16th World Congress of Otorhinolaryngology-Head and Neck Surgery. Sydney, Australia, March 2-7, 1997. 11. Prokopakis EP, Velegrakis GA, Papadakis C, Helidonis ES. Treatment of nasal allergy with the use of laser CO2. 3rd International Meeting of Upper Respiratory Tract Infections. Sissy, Crete, October 28-31, 1997. 10. Velegrakis GA, Papadakis C, Prokopakis EP, Spyridakis N, Helidonis ES. Treatment modalities of early laryngeal cancer. International Symposium in Care of the Professional Voice and phonomicrosurgery. Athens, Greece, September 25-27, 1997. 9. Balas CJ, Christodoulou PN, Prokopakis EP, Helidonis ES. Endoscopic Machine Vision System for Blood Supply Estimation of the Nasal Mucosa. Laser Applications in Medicine and Dentistry, SPIE Vienna , Austria, September 1996. 8. Velegrakis GA, Papadakis C, Prokopakis EP, Helidonis ES. Osteoblastoma of the nasal cavity arising from the perpendicular plate of the ethmoid bone. 4th International Conference on Head and Neck Cancer. Toronto, Canada, July 28-August 1, 1996. 7. Prokopakis EP, Snyderman CH, Hanna EY, Muller S, Johnson JT. Risk factors for local recurrence of adenoid cystic carcinoma. 4th International Conference on Head and Neck Cancer. Toronto, Canada, July 28-August 1, 1996. 6. Velegrakis GA, Skoulakis C, Kyrmizakis D, Prokopakis EP, Maroudias N, Helidonis ES. Bilateral Vagus Paragaglioma and Papillary Thyroid Cancer. 3rd Congress of the European Federation of Oto-Rhino-Laryngological Societes, Budapest, June 9-14, 1996. 5. Carrau RL, Aydogan B, Prokopakis EP, Segas J, Snyderman CH, Nuss D. Adenoid Cystic Carcinoma of the Sinonasal Tract. 2nd International Skull Base Congress. San Diego, Callifornia, June 29-July 4, 1996. 4. Velegrakis GA, Skoulakis C, Kirmizakis D, Prokopakis EP, Maroudias N, Helidonis ES. Bilateral Vagus Paraganglioma and Papillary Thyroid Cancer. A Case Report. 3rd Congress of the European Federation of Otorhinolaryngological Societies (EUFOS). Budapest, Hungary, June 9-14, 1996. 3. Snyderman CH, Prokopakis EP, Hanna EY, Johnson JT. Risk Factors for Local Recurrence of Adenoid Cystic Carcinoma. 6th Annual Meeting of North American Skull Base Society, Naples, Florida, February 18-21, 1995. 2. Bumpous JM, Curtin HD, Prokopakis EP, Janecka IP. Applications of Image-Guided Navigation in Middle Cranial Fossa: An Anatomic Study. 6th Annual Meeting of North American Skull Base Society, Naples, Florida, February 18-21, 1995. 1. Bonilla J, Prokopakis EP, Rimmel FL, Kenna MA, Carrau RL. Laryngeal Neurofibromas in Children. 10th Annual Meeting of American Society of Pediatric Otolaryngology. Durango, Colorado, May 27-30, 1995.